THE GREATEST GRIDS BETWEEN GLASS? YOU DECIDE! Our GBG (Grid Between Glass) Products deliver all the maintenance-free convenience and durability that make GBG windows so popular, plus benefits that only CGP brings you. Let’s start with that special look you seek — the reason you’re here. At CGP, we start with an unsurpassed variety of muntin and shadow bar profiles, materials, and colors, ready to form into a grid of your specifications and seal between your chosen glass. And what if your look demands an unavailable profile, material, color – or even all three? This is where CGP leaves other GBG sources in the dust. We simply have you draw up and spec out the grid of your dreams. Then, we custom-make it right here in the USA … quickly, precisely, efficiently, and economically, using 100% recyclable materials. WHY SHOULD I USE GRID BETWEEN GLASS WINDOWS? A major advantage is that they are maintenance-free due to the fact that they will not need to be repainted and are not subject to wear and tear. Also, cleaning the windows is much easier are the grids do not create nooks to be cleaned. As our window grids are custom made, they can be made to suit any size of window. 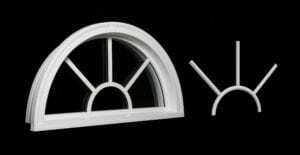 Contact us with the measurements and design of your windows and we can quote you for your project. HOW LONG DOES IT TAKE TO MAKE THE GRID BETWEEN GLASS WINDOWS AFTER I ORDER? With your quotation, you will be given an estimated lead time but the time it takes depends on the individual size and design of the window.